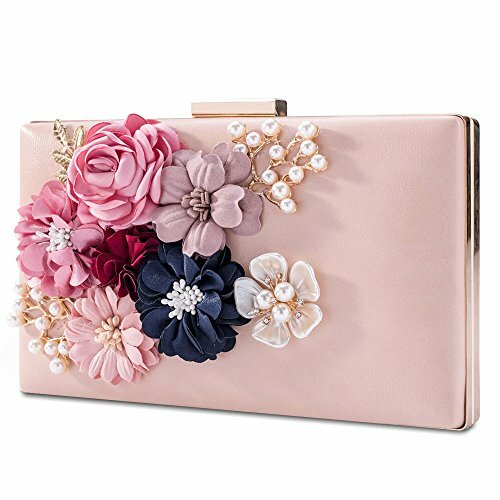 Our beautiful flowers deocr clutch bag is so elegant for wedding parties or daily use. It is high quality with metal frame and hard case, and the satin interior can protect your treasures from scratching. Two detachable shoulder chains provide for you, you can use it as shoulder bag, handbag, clutch Or purse. It can hold something you might need like 5.5" cell phone, lipstick, nail polish, poweder puff, tissues, card, etc. Size: 20cm x 12cm x 3cm / 7.87"x4.72"x1.18". Size of Chain: Short one's length is 38cm,about 18cm using length, The long one is 112cm unfolded, about 50cm using length. 1. The Color will be slight different in different lights. 2. The Size will be some errors because of manual measurement. 3. How to open? Don't twist! Just lift the button up gently. 1. MATERIAL: PU cover, Metal frame, Satin flowers, artificial pearls and diminutive rhinestones decor, Satin interior. 2. Useage: Can be used as many different styles, Like Clutch, Cross-boy bag Or Shouler bag with 2 removable chains. Very lightweight,come with a slim silver metal chain for an elegant shoulder bag. It's so fashion and elegant for cocktail/ birthday/ prom/ wedding party, baby shower, Engagement, Social Activities, nightclub or night out. Great gift for bridal, bridesmaid, women, ladies, friends, etc. 3. Size: 20cm x 12cm x 3cm / 7.87"x4.72"x1.18". You can easily fit your cell phone(fit for iPhone 8s plus), cards, money, car keys, small wallet, mirror, lipstick, some makeup etc. The Glossy Satin interier can protect your kits from scratching. 5. If you have any questions, Please contact us or give any advice, we will reply within 24 hours. If you have any questions about this product by LONGBLE, contact us by completing and submitting the form below. If you are looking for a specif part number, please include it with your message.